While Vita was "manufactured" by the Book of Darkness � an artifact so technologically advanced that it recreates itself from nothing whenever destroyed - for all intents and purposes she is a sentient humanoid who bleeds, has emotions, eats food and does everything you would expect of a human. The book mutated from its original form, and it created Vita and the other knights to gather magic power to perpetuate its cycle of destruction and reincarnation. 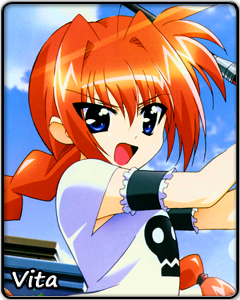 However, the book's latest master is a girl named Hayate who, despite being terminally ill, has nothing to wish for except for a happy life with the guardian knights. While the knights have adjusted to this happy life, their master's worsening condition moves them to begin filling the book's pages again. As the (eternal) loli of the four Volkenwritter knights, Vita fights with Graf Eisen (Iron Count), a device shaped like a hammer. Despite her appearance, she is the fiercest of the Velka knights who charges into close range with a war shout. At home, though, she falls into the 'iiko' (good girl) role around Hayate; even her combat outfit boasts plush rabbit faces inspired by a rabbit plush bought while shopping. With the power of their opposition growing, Vita's quest seems futile. Despite this, Vita pushes herself harder as she looks forward to a warm meal cooked by Hayate. Vita is a gruff but determined companion, a good girl in Hayate's family, and a knight loyal to her master.